This quick to prepare family casserole is bound to become a favourite. The sweet potatoes add a sweet, rich flavour and vivid colour to the tender pieces of British chicken. 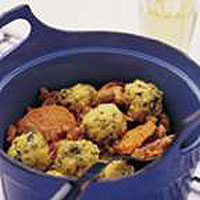 The polenta and herb dumplings are light and absorb the flavour of the casserole. Heat the oil in a casserole dish, add the onion and fry over a moderate heat until soft. Add the chicken to the onion and cook for 5 minutes until sealed. Add the sweet potatoes to the chicken. Cover and cook for 10 minutes. Stir 200ml cold water into the casserole, season, replace the lid and cook for a further 10 minutes. Mix the polenta, suet and herbs in a bowl, add 50ml cold water and mix to form a dough. Shape into 8 small balls, add to the casserole, replace the lid and cook for a further 20 minutes. Serve with a green leaf salad. Freezes well once fully cooked. Chopped sun-dried tomatoes or finely chopped cooked bacon can be added to the dumplings along with the herbs. Heat 1tbsp oil and fry a small chopped onion, add 6 whole chicken thighs and cook for 5-10 minutes to seal. Pour a jar of Loyd Grossman Red Thai Curry Sauce over the top and cook for about 10 minutes. Serve with basmati rice and a vegetable stir fry.